Blog What Would You Do with Your Pets in a Fire? 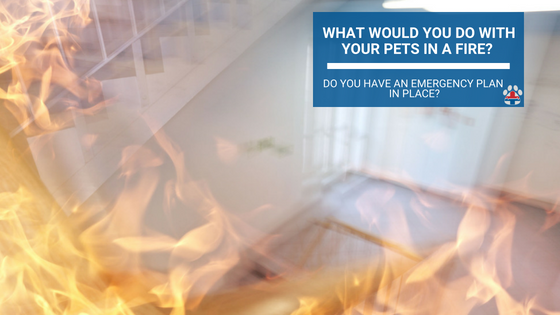 What Would You Do with Your Pets in a Fire? These are stats from 2010 so while I hope they have decreased, I can only assume with pet ownership increasing, that these numbers have as well, “an estimated 500,000 pets are affected annually by home fires, however, nearly 1,000 house fires each year are accidentally started by the homeowners’ pets, according to data analysis by the National Fire Protection Association” posts the AKC.org. I have already written about how appliances can cause house fires, but it’s time to consider and I will address later in this post, that our pets can be responsible for setting our homes on fire as well. As a pet first aid & CPR enthusiast, I set up google alerts for my interested topics and I cannot say a week or even a couple days go by without a news article discussing pets caught in a house fire. This keeps me on my toes and finally made me take some precautions in my own home to ensure what would happen to my pets if a fire broke out, whether I was home or not! Here is what I have done but I would love to update this post with any of your ideas as well so drop a line in the comments. Having your pets collared and tagged is a no-brainer for most but I’ll be honest, mine often run around naked as we say. This is risky and I do not recommend it for so many other reasons than just a fire. We do have slip leads placed strategically throughout our house, but that doesn’t help our dogs if one slips away. Make certain your pets are collared and microchipped. We have leashes almost in every room, I’m not kidding. My husband and I have a few in our bedside tables, you never know when you will need them. A dog could injure themselves and a leash will help you control them and provide first aid, or of course, in the event of a fire, you can leash your pups and walk out. Fires won’t happen in a convenient area most of the time. Plan your exits based on being anywhere in your house, the bedroom, TV room, kitchen etc. If one section of the house was in flames, could you still get out? Think about this and plan because when you have a fire, your adrenaline will flood your system. Thinking clearly will be challenging. Just like with the leashes, a fire could break out, you get out of your house safely with your pets on leash but now what? It’s cold, hot, raining, where can you shelter, if not at a neighbor’s? Your car could be your savior but it’s only as good if you can get into it! Seriously, have carriers where you can, the hall closet and upstairs. The money you spend on an extra carrier will be well worth it. Also get them used to it before you actually need to use it. Our smoke alarms go off more than I would like to admit. My husband is a wonderful cook, but smoke happens. We all know how anxiety-inducing this sound is for us but it could throw your pets into a panic. Try first by making them beep when you check the battery and feed your pets a treat. Work up slowly to more beeps until you can have it set off and they will still take treats. Essentially you are desensitizing your pets to the awful noise. It’s one thing for you to panic during a fire, but you need to find your pets and get them out safely, so the less they panic, the easier it may be. This keeps your contact info and their name on them at all times. Many first responders are pet lovers, give them the best chance to help your pet. When a stranger knows their name, your pets may feel more comfortable. 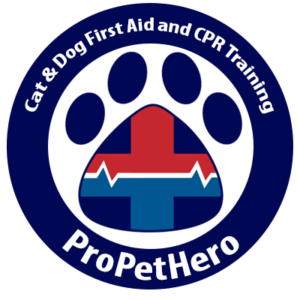 This can help the first responder have a better chance of saving your pet’s life and getting in touch with you to get them the medical care they need. In the case of a fire, firefighters are walking into a house with low visibility. Letting them know you have pets will help them prioritize saving them. 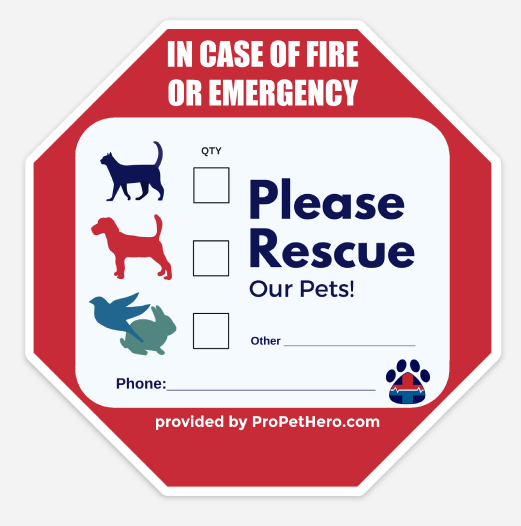 To purchase the pet emergency stickers click here, free shipping in the contiguous US. It doesn’t hurt to have this on the fridge or their crates. Keep your info nearby so the faster they can get in touch with you, the faster you can react and provide the care your pets will need. Keep them safely contained – crates can keep curious pups away from electrical cords, jumping up on appliances and turning them on (like your stove), getting into things etc. Consider healthy confinement when you cannot be around. Consider flameless candles – not only can curious pets knock candles over or even burn themselves on them, the burning fumes can be harmful to you and your pets. Remove stove nobs – one of our client’s dogs almost burned down their house trying to reach the Doritos they left on top of the stove. The dog repeatedly jumped up trying to get them and started the stove, which melted the bag and set the Doritos on fire! Do not leave glass water bowls on the deck or near the house (or any glass) – remember learning how magnifying glasses can start fires? So could that glass bowl of water you left on your deck for your pup when it gets hot. Use stainless steel or something that is not seethrough for their safety and your home’s. Strategize about where to place leashes, how to get out, where your contact information is and also know where you could go afterward. Do you have family, neighbors or friends you can stay with? Do you know where a pet-friendly hotel is near you? These are things to think about and save in your phone or car now, so when they happen, you can spend less time worrying about that and focusing on keeping your family safe. For more information on how to know how to handle emergencies with your pets, take a pet first aid course. Take the thinking out of your adrenaline rush, your pets will thank you for it. I just read your article this morning it was very informative and helpful. I do have my Pets First Aid certificate since last summer. I would love to have one of your stickers. We have 9 cats in our family. They are all very unique and different. One of our cats is named Cara and she has a twin sister Tara. Samara is the Mommy of three babies that are over 1 years old; Megan Love, Patrick and Shawna. The other three are Socks Jr, Socks Senior and Missy. Hi Cara, these are good tips. One thing we also do is keep paracord/caribiners and harnesses under our bed in our master bedroom where we all sleep. The idea is that if there were a fire overnight, and we couldn’t get downstairs, that we could lower the dogs down to the ground from an upstairs window. We also have fire extinguishers in several places throughout the house, including the bedroom. Hey MB, great tips as well. Very important to think about the exits. We have a porch roof we can climb onto from our bedroom window and thus jump down onto the porch, lowering the pups to each other but not everyone has that! Yes to the fire extinguishers, we have one on each floor. There certainly is a lot more that could be added, much is dependent on your living situation, pets, etc. It’s wonderful to get thinking and planning now before something happens.